Livestock insurance agents market various types of insurance coverage to livestock producers. Livestock insurance agents provide insurance policies to protect the animals owned by their clients. A variety of coverage options are available including individual coverage for specific high-value animals, blanket coverage that includes both farm property and animals, or herd coverage (the most common option) that ensures a designated number of animals of a particular species. Agents may offer coverage for a variety of livestock species including dairy cattle, beef cattle, poultry, sheep, and pigs. Insurance agents are responsible for collecting data from livestock producers, giving rate quotes, explaining coverage options, processing insurance forms, coordinating with underwriters, handling claims, coordinating appraisals if necessary, and providing quality customer service to their clients. They may also be involved with marketing their services to prospective clients, creating advertising materials for print or web-based ads, and attending trade shows or livestock events to recruit new clients. Livestock insurance agents can choose to focus on one of many livestock species including cattle, sheep, chickens, pigs, and goats, though most choose to offer services for multiple types of livestock. They can also branch out to provide coverage for other segments of the industry by offering lines of aquaculture insurance, equine insurance, or pet insurance. Many livestock insurance agents also offer coverage options for properties (such as farms and ranches) and vehicles. A livestock insurance agent can advance their career over time by moving into roles such as regional sales manager or sales director. It is also possible that they could become a partner in an established insurance agency or go out on their own to start an independent agency after building a sufficient loyal client base. Most insurance agencies prefer that candidates hold a four-year college degree, though they tend to be flexible with regard to a candidate’s college major. Varied coursework in areas such as marketing, communications, accounting, animal science, economics, business, technology, and statistics can prepare the aspiring agent for the challenges they will face as they enter the industry. Prior experience working with livestock as a breeder, livestock appraiser, livestock judge, or agricultural extension agent is also a plus. An aspiring livestock insurance agent must become licensed to sell property and casualty insurance in the state where they intend to offer their services. Specific licensing requirements for insurance agents can vary by state but the prerequisites generally involve attending training courses and seminars, passing a state licensing exam, and paying a fee. Many states also have a continuing education requirement that must be fulfilled before agents can renew their licenses. The compensation package for livestock insurance agents is often some combination of base salary, commission, and performance bonuses. Commission based pay is extremely common in all areas of the insurance industry (not just in the livestock specialty). Salary can, of course, vary based on the number of clients served each year, the types of insurance coverage sold, the geographic area in which an agent works, and their reputation in the industry. A salary survey conducted by the Bureau of Labor Statistics (BLS) indicated that the general category of insurance agents earned a median average salary of $48,150 ($23.15 per hour) in May of 2012. The lowest 10 percent of all insurance agents earned less than $26,120 per year while the highest 10 percent earned more than $116,940 per year. 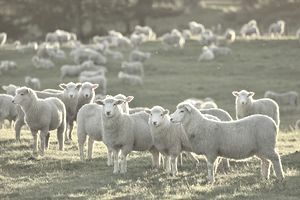 Livestock insurance remains a strong segment of the livestock industry, as farmers must safeguard their herds and flocks against catastrophic losses. According to the BLS, employment in the insurance industry is on track to grow at a rate of about 10 percent, which is approximately as fast as the average for all professions.